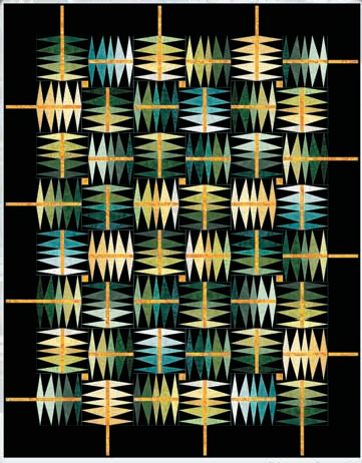 Jo Ann says, "Working from an agave (cactus) in my yard, I created this design. 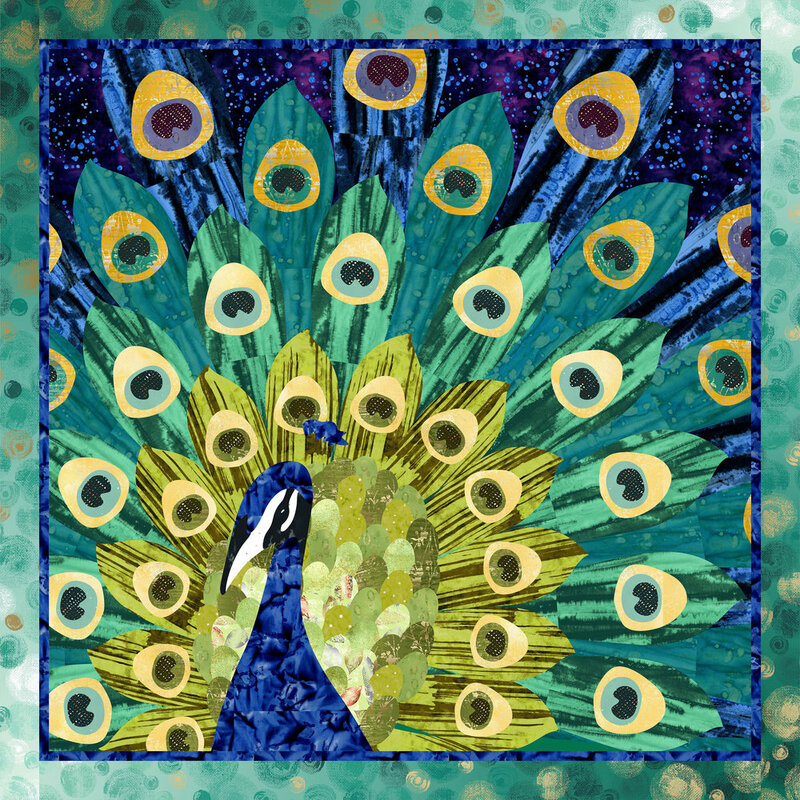 I pieced, appliqued, and painted colorful batiks." 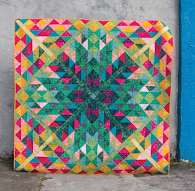 We loved this stunning quilt which depicts the flora of the Southwestern U.S. so well. 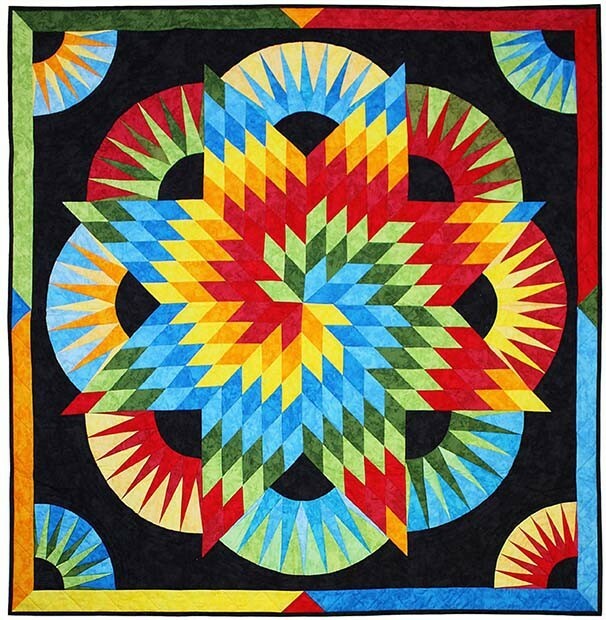 Agave Sunset won the City of Mesa, Arizona Award exemplary work and also won Second Place for Best Mixed Technique in the small quilts category. 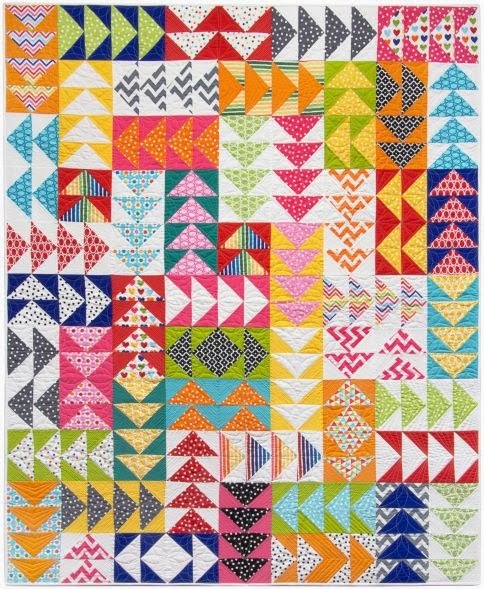 Here's a great example of how to blend traditional techniques with a contemporary motif: Jo Ann made a "flying geese" patchwork panel and spiky piecing to enhance the colors of this vibrant quilt. Second place winner for Large Pictorial Quilts, Margot says,"From children and a donkey, inspired by a 1970 greeting card, I added background details, employing applique, paint, and embroidery for a folk art effect." This adorable landscape quilt, showing a peaceful village by a mountain lake and darling children off to an adventure on their pet burro, really inspired our imagination. We were impressed by Margot's use of vibrant, clear colors. 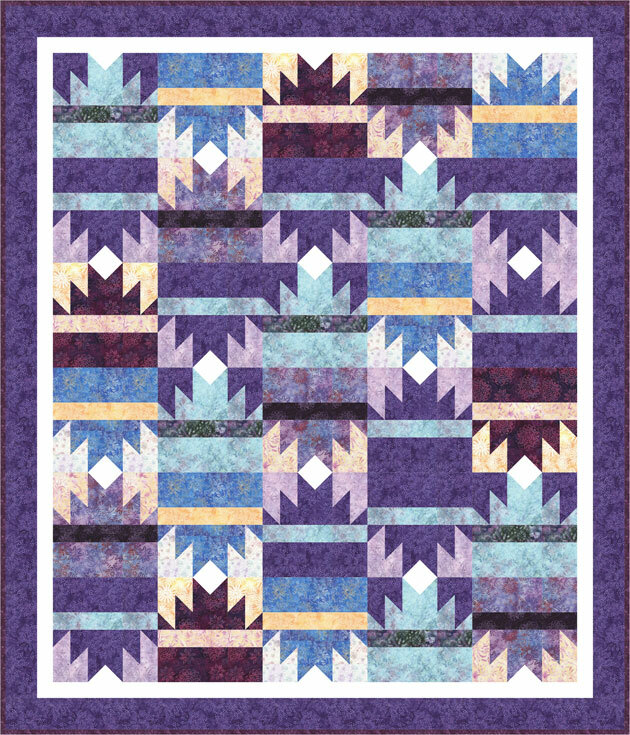 Second place winner for Digital Imaged Quilts, Vicki notes of her original design, "I used a negative, purple, variegated Agave image by photographer Camille Spurlock to print with archival inks onto silk charmeuse for a cactus beaded quilt." Vicki embellished her work with elegant, tiny blue beads which outline and enhance the luminous quality of these spiny, symmetrical leaves. 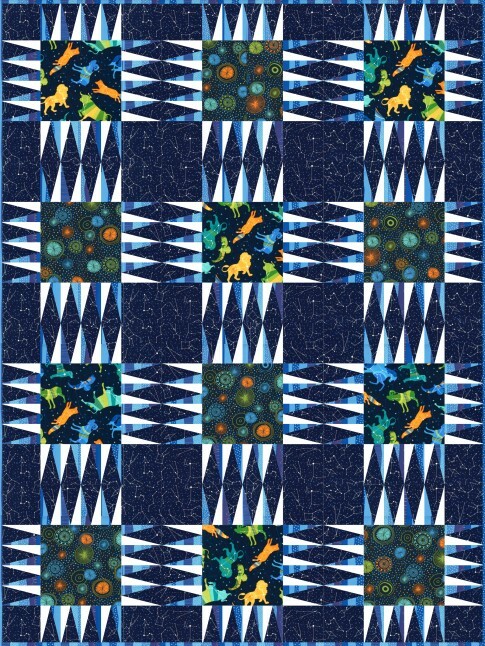 First place winner for Pictorial Small Quilts, Georgia explains, "[This original design was] made for a 2013 exhibit at the Phoenix Japanese Friendship Garden. A vital part of the beauty and ecology of a Japanese garden are the colorful koi [fish]." We enjoyed this lovely machine applique work, along with the pretty thread painting of the undersea plants along the bottom of the quilt. 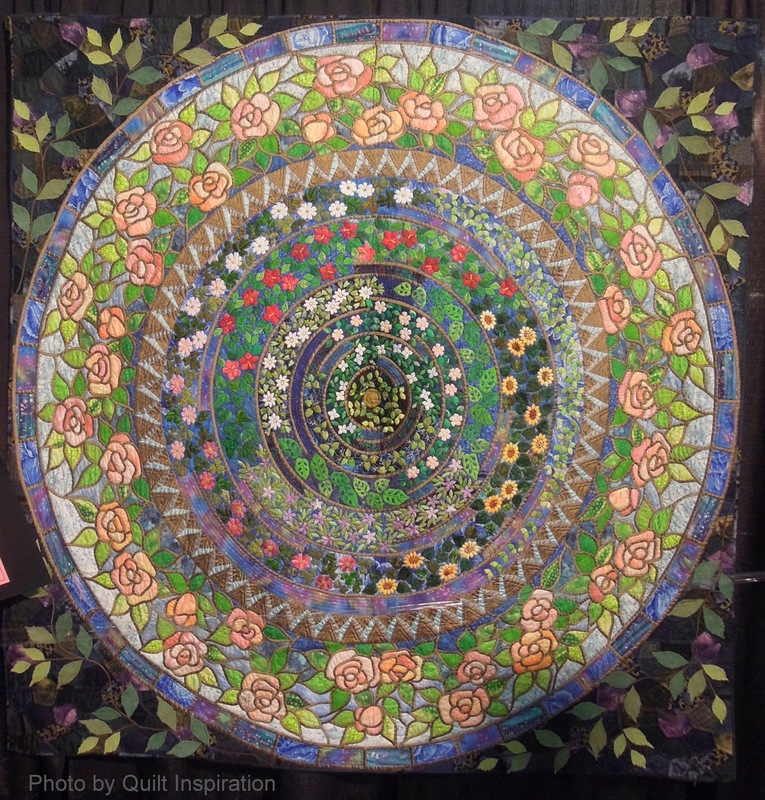 Best of Show and First Place - Large Pieced Award winner this year, Ann writes, "My original center star, borders, layout, and painted quilting designs were added to Norah McMeeking's St. Mark's Wallhanging pattern of Roman mosaic tiles." 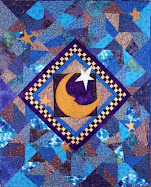 Ann notes that after quilting the motifs around the star, she painted them with metallic paint to give them added luster and clarity. 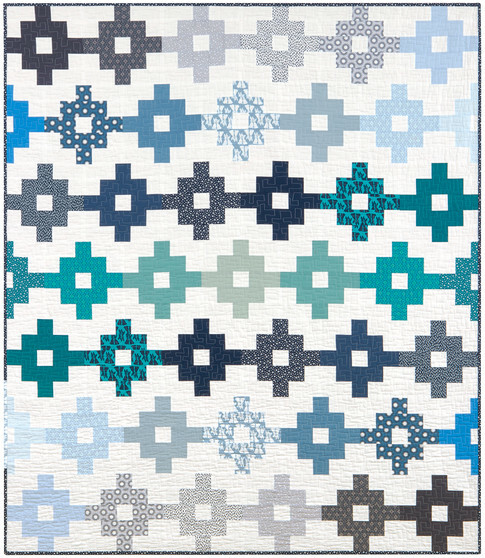 This show stopper also won the award for Excellence in Machine Quilting at the 2013 Road to California Quilt Show. Last week we talked about Hanami (flower viewing) in Japan (see It's Cherry Blossom Time) ! 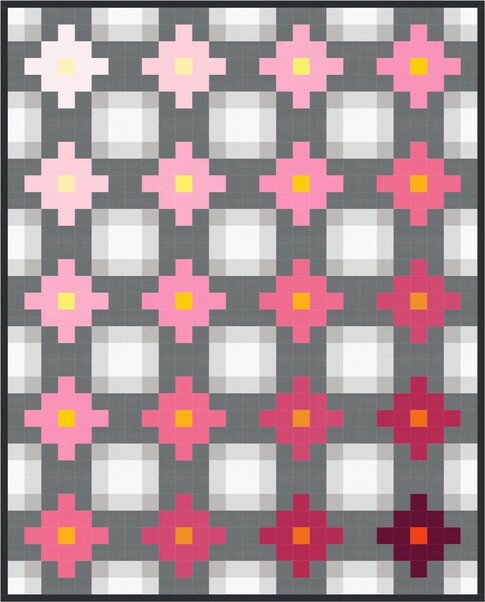 Today we're featuring more beautiful floral quilts inspired by springtime in Japan, as shown at the 2013 Houston International Quilt Festival. 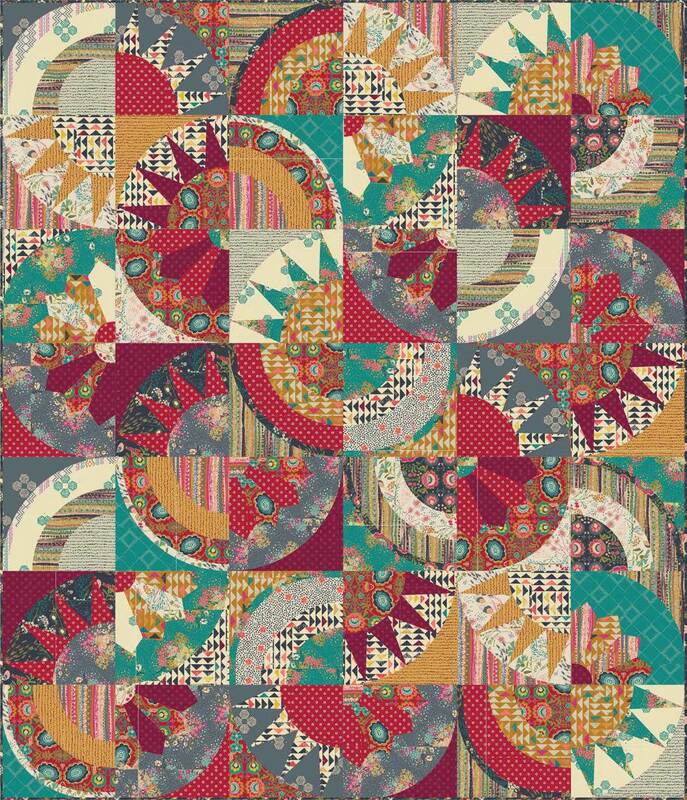 We love these intricate and innovative works of art by our fellow quilters across the Pacific. From a distance the flowers appear as clouds, while the beauty of single blossoms can be enjoyed close up. Harumi writes, "Our sons became independent and my husband's and my life together started. We talk pleasantly together, drinking afternoon tea in the yard." Teatime in my Yard was exhibited in Hands All Around, a showcase for contemporary international quilt design at the 2013 Fall Quilt Festival. 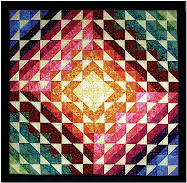 Harumi's magnificent stained glass quilt is hand-appliqued, pieced, and quilted, plus some machine piecing. 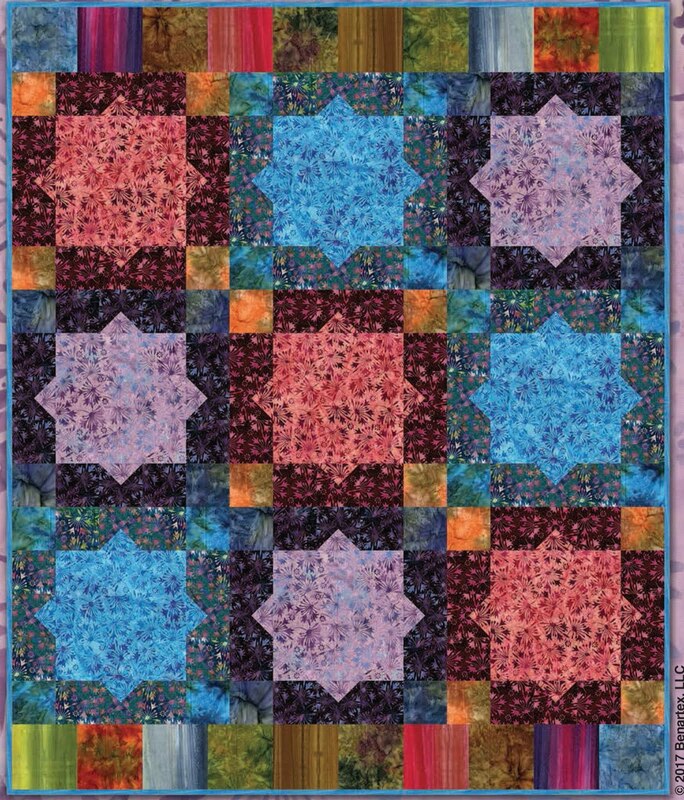 This stained glass quilt was based on a European dome roof design. 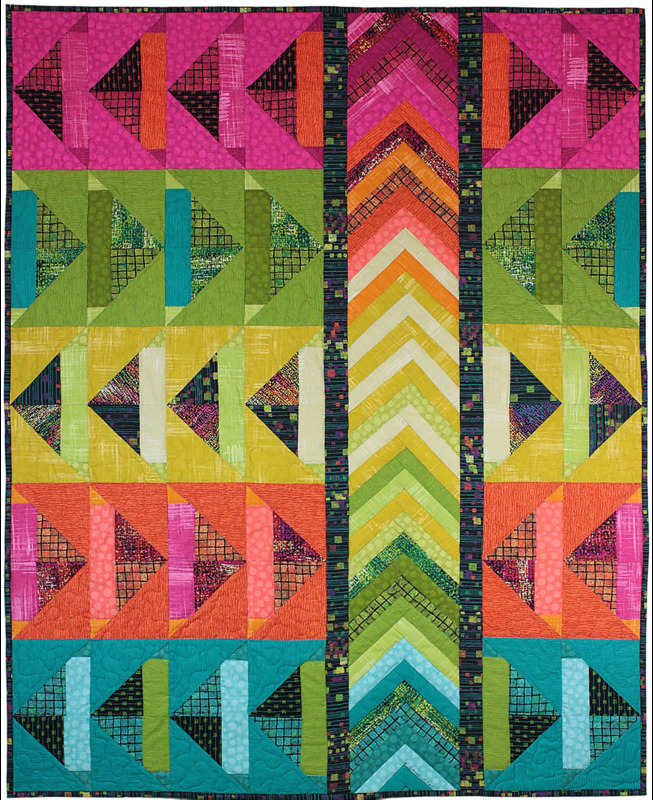 Here you can see the variety of green and peach fabric colors and patterns used by the quilt artist. We were amazed by Harumi's handwork especially in creating the stained glass leading, which is most impressive. 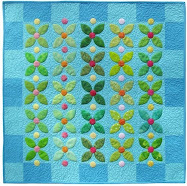 Akiko states," In 2010, I visited the United Kingdom and was inspired to make a quilt of roses. Taking a walk in the park in London one morning, I was surrounded by the mellow smell of roses in the refreshing morning breeze. 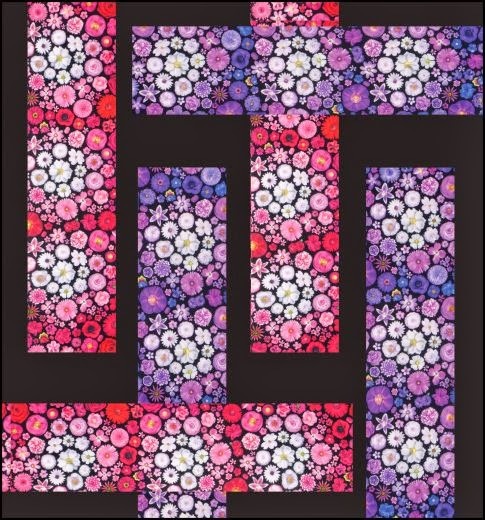 Using the Nine Patch block as the background, with appliqued flowers on top, I made this quilt...filled with a lot of roses, which remain in my heart." Akiko notes that her design source was her love of flowers. 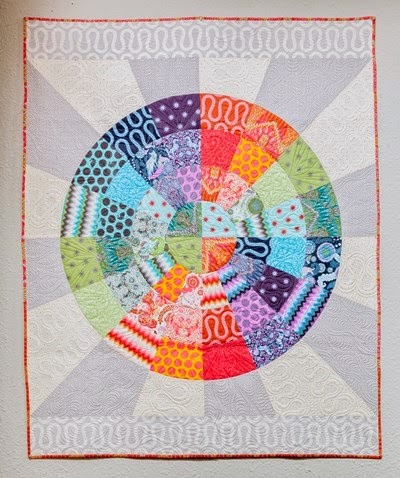 Her stunning quilt is machine-pieced, appliqued, and quilted, plus hand-appliqued. As you can see in this close-up, this satin stitch around the outside of the flower petals gives a very eye-catching three dimensional effect to the lovely roses. 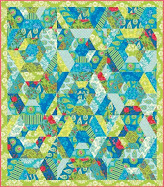 Junko notes, "I love patchwork patterns and always make blocks at first. 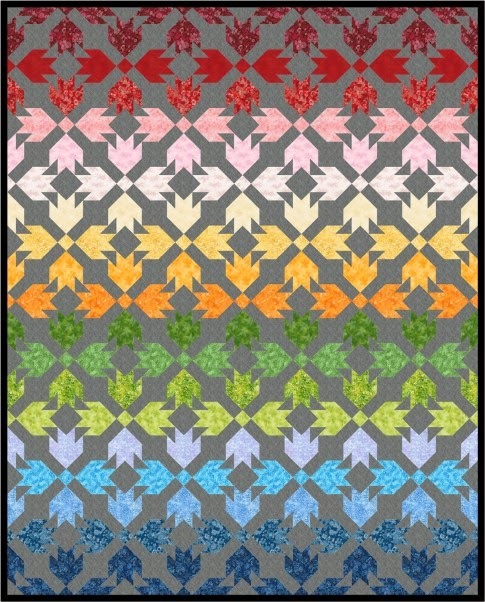 Then I think about the whole design of a quilt. This time, the blocks look like flowers, and I decided to make a garden with them. I added trapunto in the background." 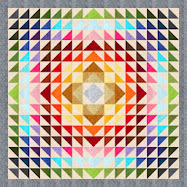 This quilt was a prize winner at the 2012 International Quilt Week in Yokohama. 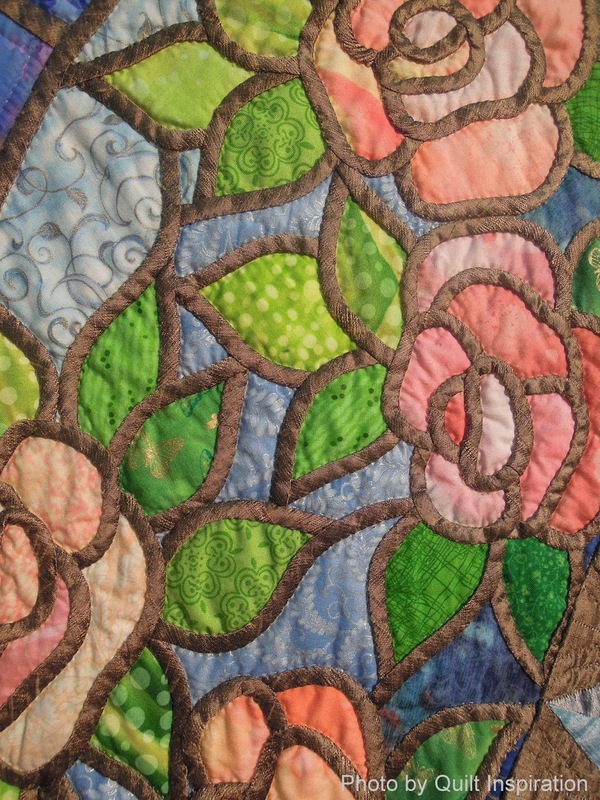 Here's a close-up of Junko's trapunto and hand-quilting in the center medallion, which is just exquisite. 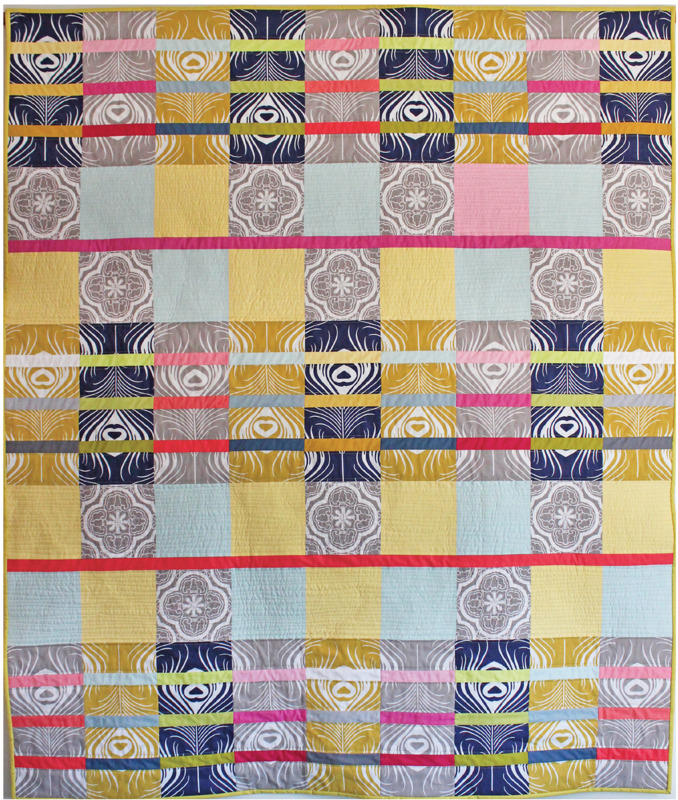 Besides containing trapunto work, Junko's very pretty quilt is pieced, appliqued, and quilted. 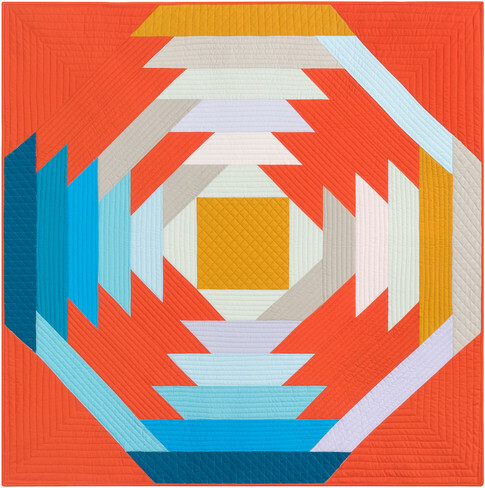 The complementary colors of periwinkle blue and tangerine orange in these pinwheel-themed blocks really help them pop right off the printed background. Harumi says, "Many kinds of flowers bloom in the yard of my home every year. Times may be difficult, but the flowers still have beautiful blooms. I took pictures and printed them on cloth, and I inserted them in the applique of a flower. " 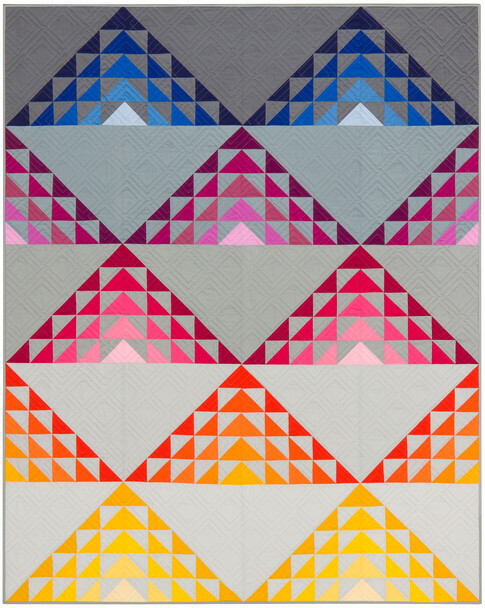 Harumi notes that her design source is other stained glass quilts. 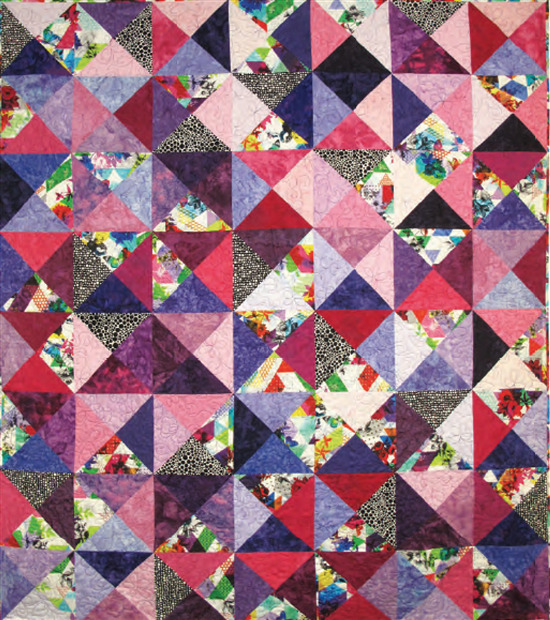 Her work is computer printed, hand-pieced, appliqued, and quilted. 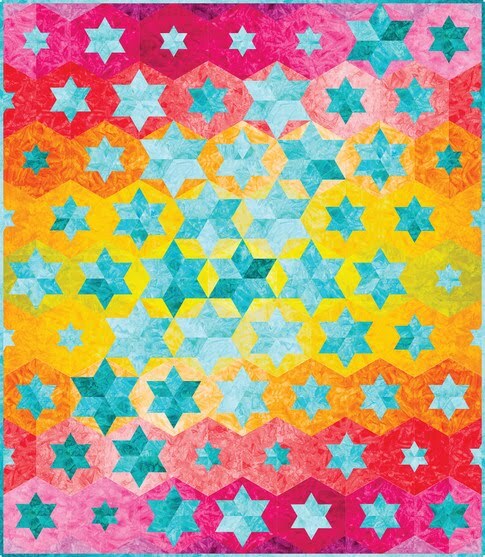 We love this beautiful star pattern, which looks like dozens of small bouquets of roses, daisies, and wildflowers. Image credits: Photos were taken at the 2013 Houston International Quilt Festival. Spring has sprung, and it's Cherry Blossom time around the world. Hanami (flower viewing) is the Japanese traditional custom; many people visit parks with cherry blossoms and hold picnics beneath the trees (see Sakura-Japan). In the US, the 2014 National Cherry Blossom Festival (Washington, DC) and the International Cherry Blossom Festival (Macon, Georgia) open this week. 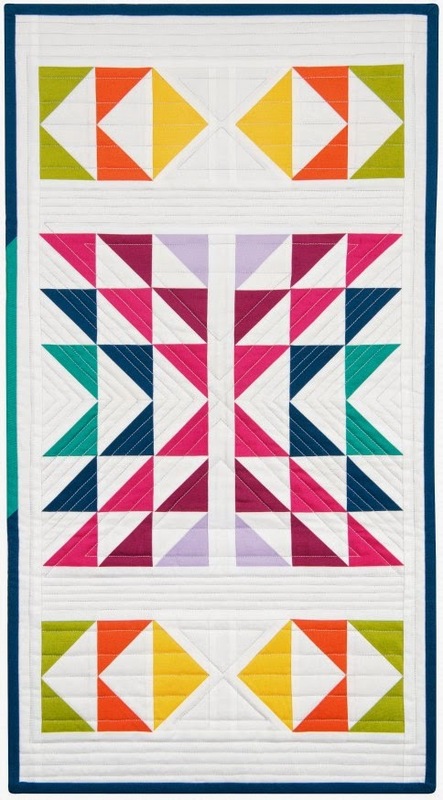 Here are some quilts to celebrate the season ! 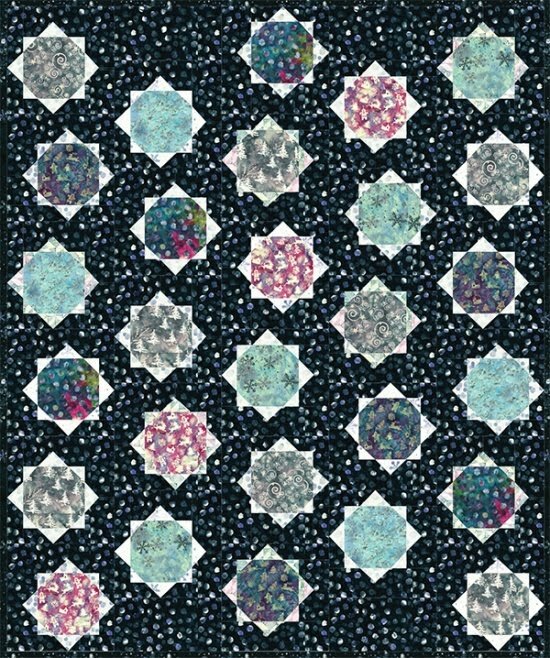 This quilt was inspired by the cherry blossoms and floating petals in the moat of the Imperial Palace in Tokyo, which were "breathtaking....Noriko loves them in full bloom." 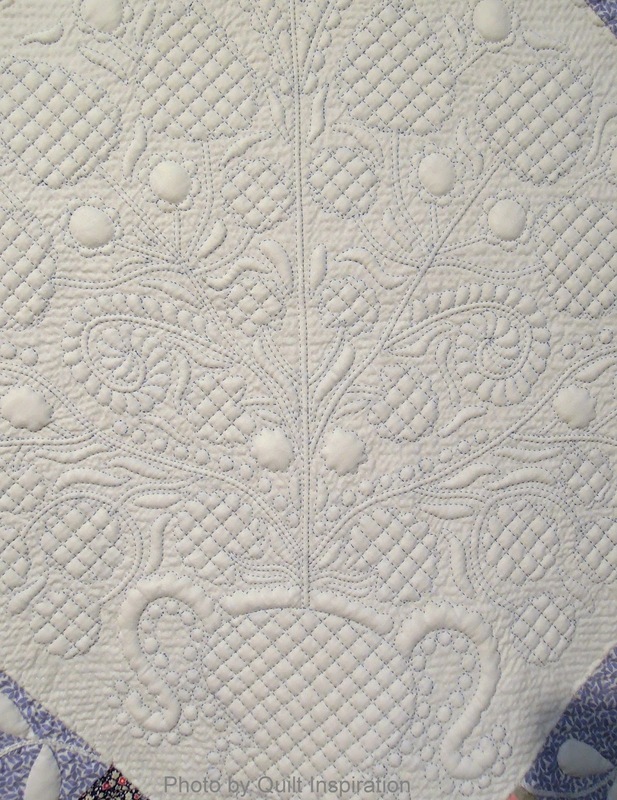 Noriko's quilt is a fascinating study in contrasts; the delicate, ethereal, dainty pink blossoms are juxtaposed with the strong, massive dark trunk of the tree. 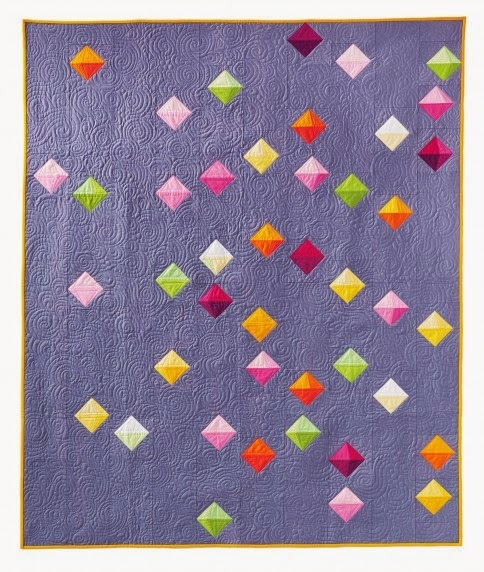 Noriko is also a traveling quilt teacher who conducts classes in this elegant style of quilt artistry. 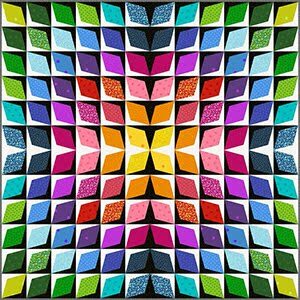 In addition, she's published a book which looks very inspiring to us, titled, Confetti Naturescapes: Quilting Impressionist Landscapes. Lynn was inspired by Monet's paintings. 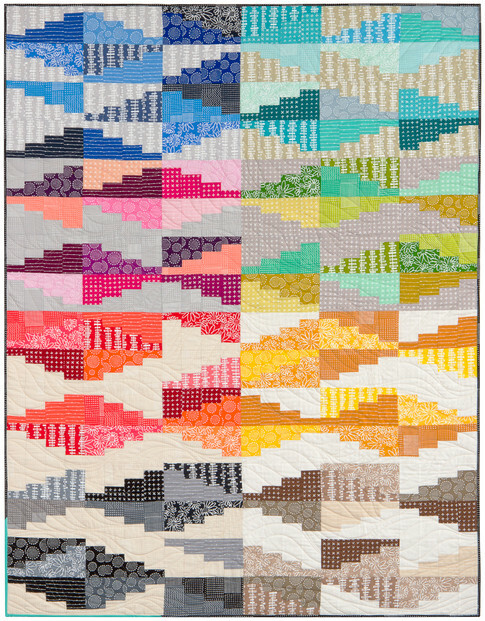 She says: "This quilt was made for a Mountain Art Quilters' challenge, an amazing group of art quilters in the California Sierra foothills." We love how the green and lavender tints of the sky provide an eye-catching backdrop for the icy rose and mauve tints of the blossoms and the deeper accent colors of the tree itself. We really liked the quilting pattern of small bubbles in the background which helps the elegant design of the appliqued blossoms and tree branches pop right into the foreground. In Korea, the spring flower festivals are about to begin. Jung notes, "The distant mountains of snow have not melted, so far this winter, but the spring breeze is blowing. A flush of green and blooming flowers foretell the coming of spring with its joyful sounds. This is a refreshing perspective, as it seems we are looking down from an elevated vantage point on this lovely landscape scene, with its rainbow of colors. Jung's stunning technicque of using thousands of tiny fabric pieces to reflect light reminds us of the late 19th and early 20th century European painters' innovative style of pointillism. Jung notes, "As a child, I read The Giving Tree. Nature gives all for us. The tree gives flowers, fruit, and shade to make everyone happy." Look at all the fabulous shades of pink used to construct this tree in what seems to us to be an original, innovative "collaged" look to Jung's work. 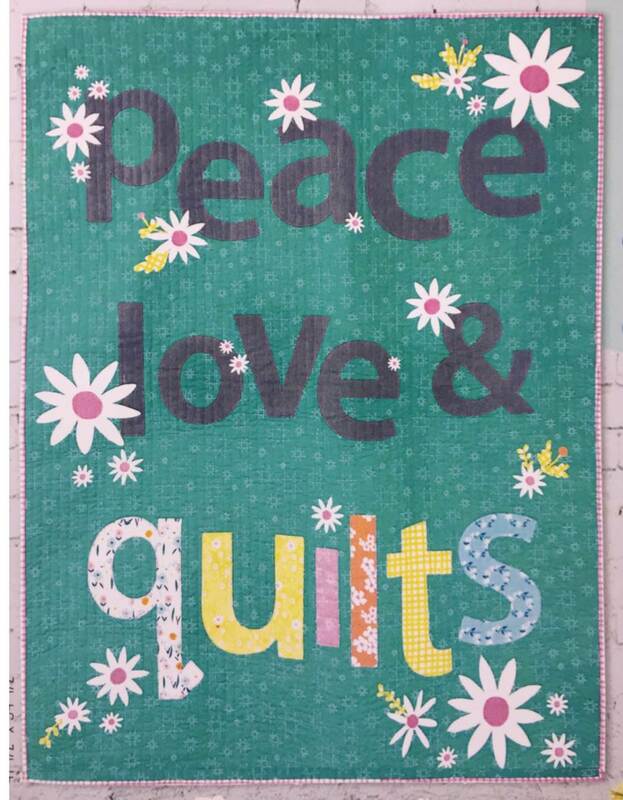 Image credits: Photos were taken by Quilt Inspiration at the 2014 AQS and 2013 Houston IQF shows. 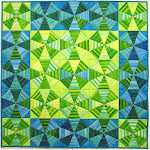 Happy St. Patrick's Day to quilters everywhere! 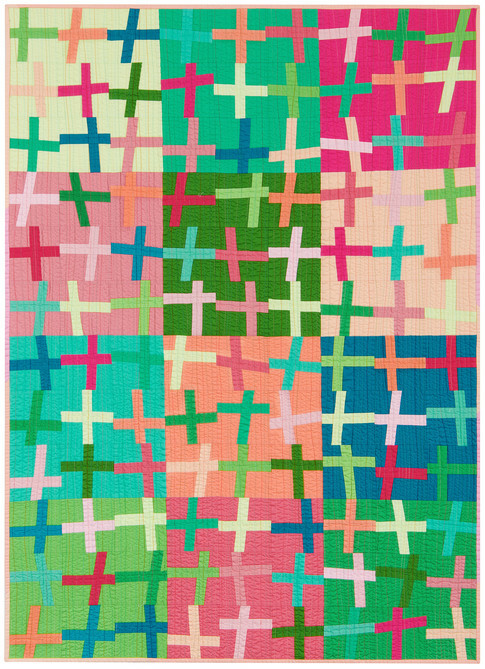 Today, we celebrate the "wearing o' the green" in honor of the patron saint who brought Christianity to Ireland in the 5th century A.D.
Jaynette's quilt is a beautiful example of an unbroken interlaced design that is historically popular in the Celtic lands of Ireland, Scotland, and the rest of the United Kingdom. Celtic knot designs are very old, and some of them date back to the mosaic floors of churches in the Roman Empire in the second and third centuries A.D.
Jaynette notes, "I love adding Celtic knotwork to my quilts, and the joy of (over 2,400) hand-beaded embellishments adds so much sparkle and light. " 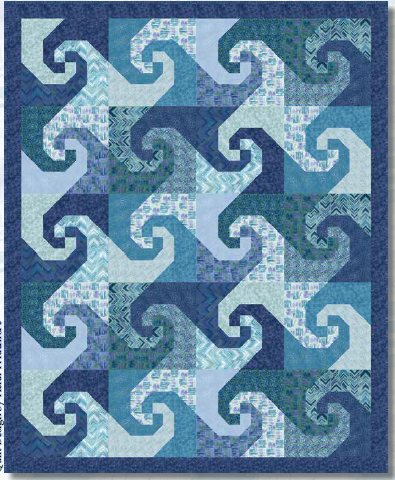 Jaynette paper foundation-pieced these blocks and hand-appliqued the Celtic knotwork using cotton fabrics to create this fabulous quilt with its outstanding workmanship. In this close-up, you can see the golden coins represented by over 225 circles which are hand-stuffed and appliqued. The golden coins are symbolic of the treasure which is said to be stored up by the little leprechauns, mythical Irish fairies, who each keep their own pots of gold. 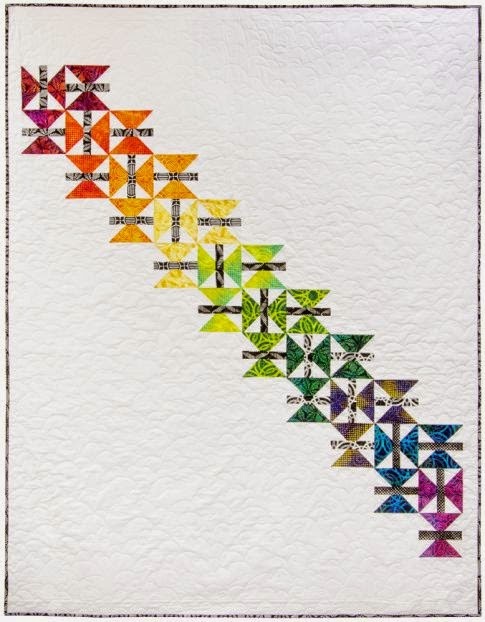 On the dark border, you can see some of the very pretty metallic thread that Jaynette used for quilting her fantastic creation on her home sewing machine. 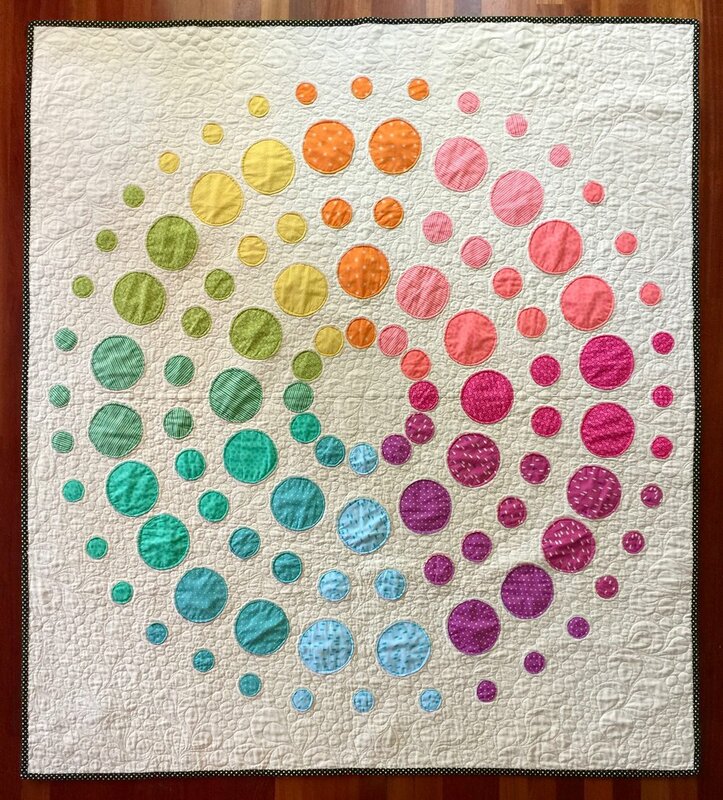 ﻿She continues, "The use of metallic threads for machine quilting was a new technique and tool. 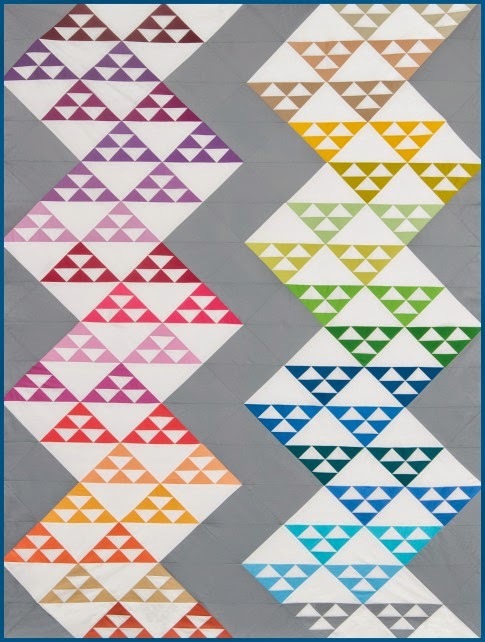 ( Now......on to the next quilt!)" March is the month of green, from the arrival of springtime in the northern hemisphere, to the celebration of St. Patrick's Day on March 17. 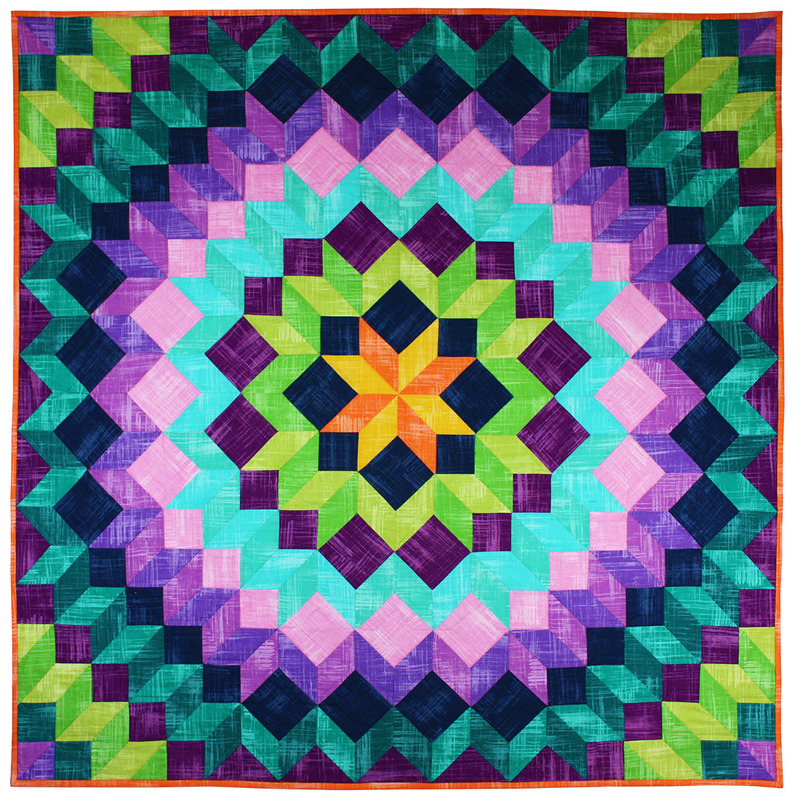 Today, we're featuring some exciting green quilts from the Houston International Quilt Festival and the American Quilters' Society show in Arizona. Norma says, "[This is] part of a series in which I explore different combinations of my hand-dyed fabrics and the use of my 'wonky' piecing to suggest buildings. 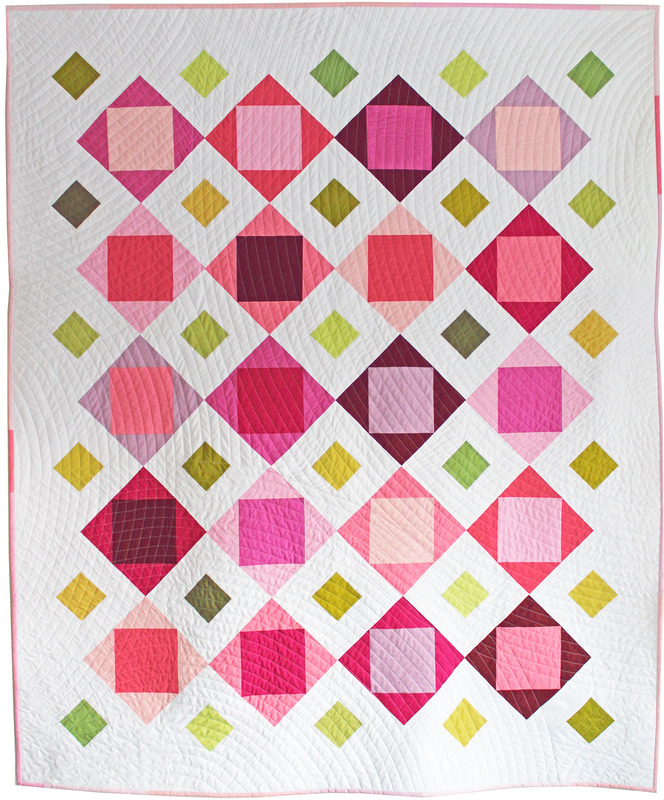 I dyed 40 yards of fabric for this quilt." 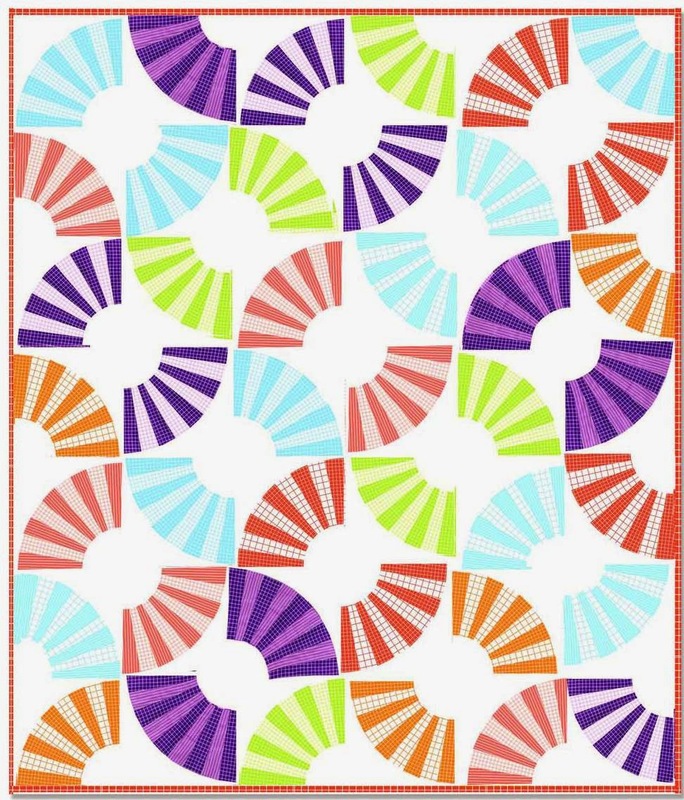 We really like the geometric spiral quilting pattern on the buildings in this quilt! 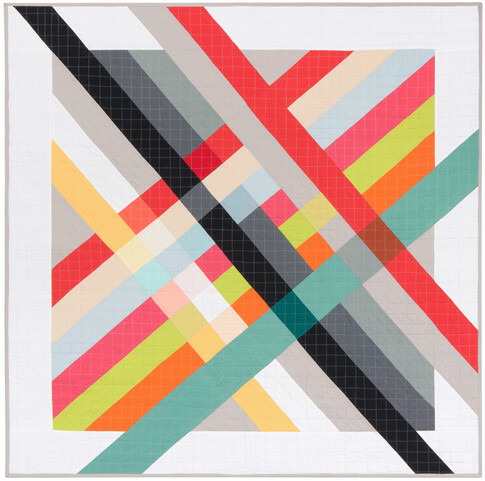 This quilt is from her Configuration series (for more examples, see geometric art quilts.) 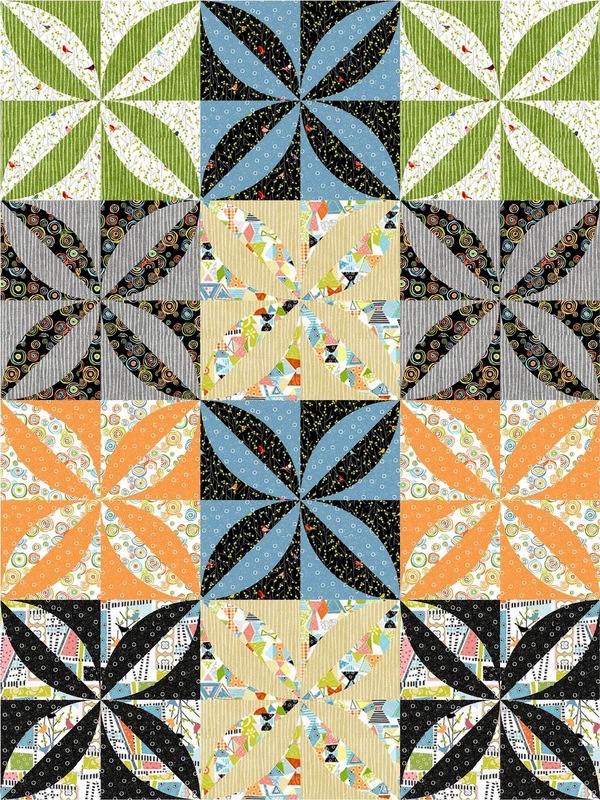 In this quilt, Norma has tranformed the image of city buildings from being impersonal, standardized designs into warm, individualistic spaces with her gently curved lines, cheerful colors, and creatively shaped "windows". Emerald City was purchased by Yale Maternal Fetal Center in New Haven, Connecticut for display in their waiting area. For details, see Norma's Exciting News. Kit notes, "I came across the Welsh word hireath online and discovered that one of its meanings is homesickness tinged with grief for the lost. I was struck by this concept and made a piece that reflected the little girl I once was......though she lives on in my heart, [she] is ...lost to me. As a child, I spent nearly all my free time outside, especially in summer, when the seemingly endless sunny days allowed me to leave the house." Look at all the imaginative animals who accompany Kit on her outdoors journey! 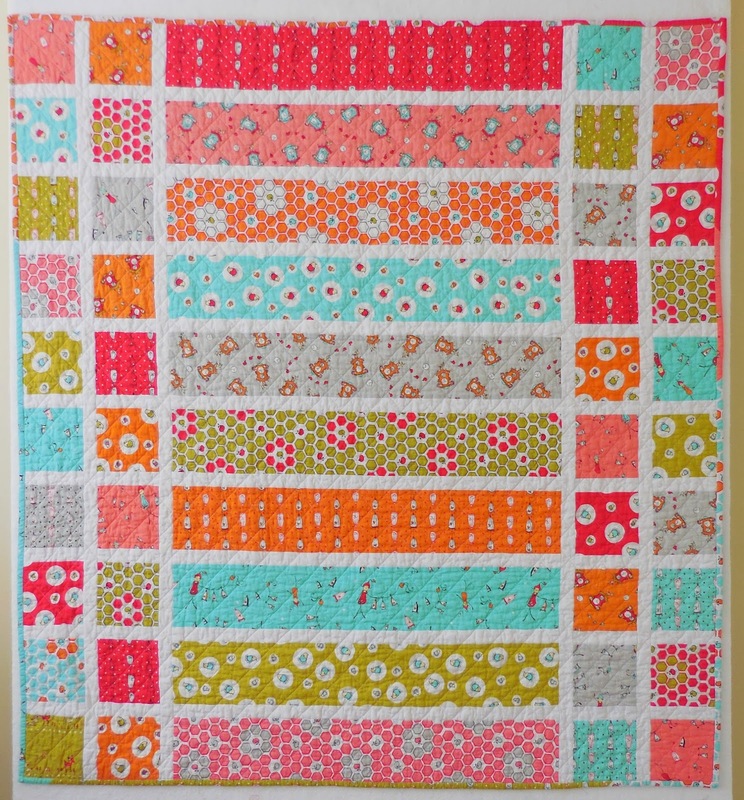 This joyous quilt reminds us that it would be great to be young and carefree again. Kit adds, "Little Kit lived in a pastoral world filled with all manner of friendly creatures real and imagined, and the sun shone lovingly on her face." We love the feeling of childhood wonder and innocence that is portrayed here. Kit's work is quilted, painted, fused, stitched, and needle felted. Joanne writes, "I was in England in 2009 and saw this beautiful crop circle. 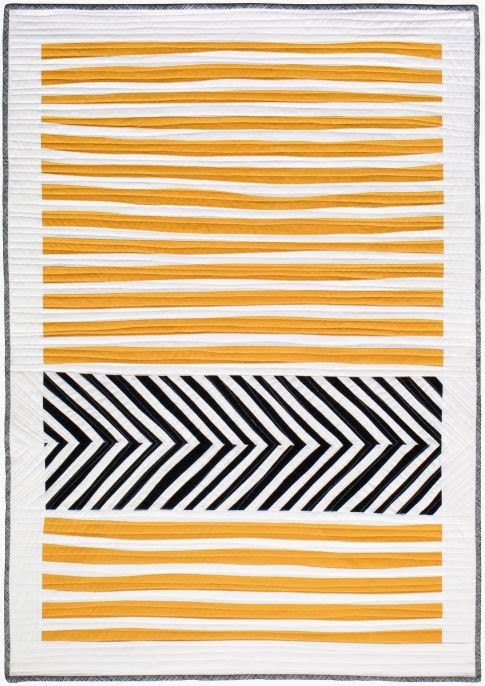 Everything about it reminded me of a giant quilt - complete with an Orange Peel [pattern] variation center medallion, surrounded by fancy pieced blocks and finished off with scalloped edges and picots ! It also had a stunning woven inner frame which added even more interest to the 'quilting' patterns of how the crop was laid down." 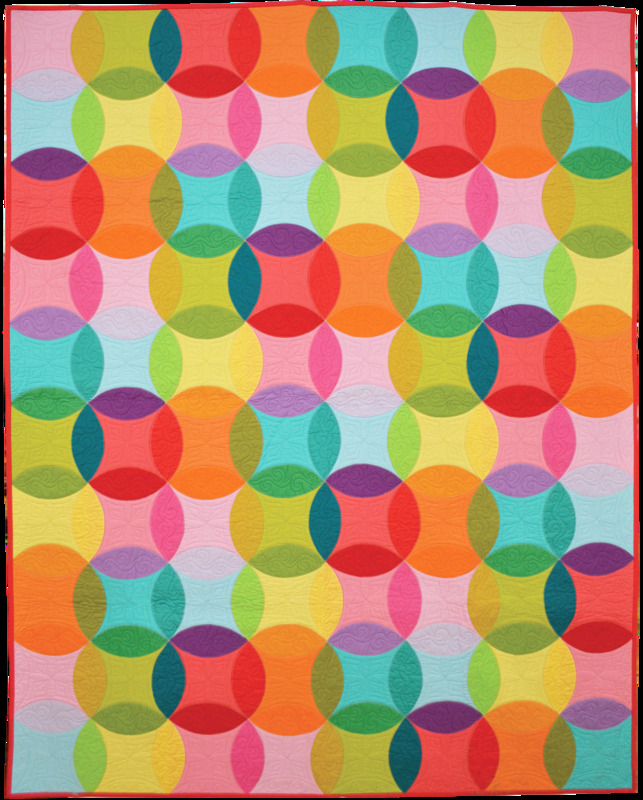 Joanne adds, "This is one in a series of quilts I have made based on actual crop circles. 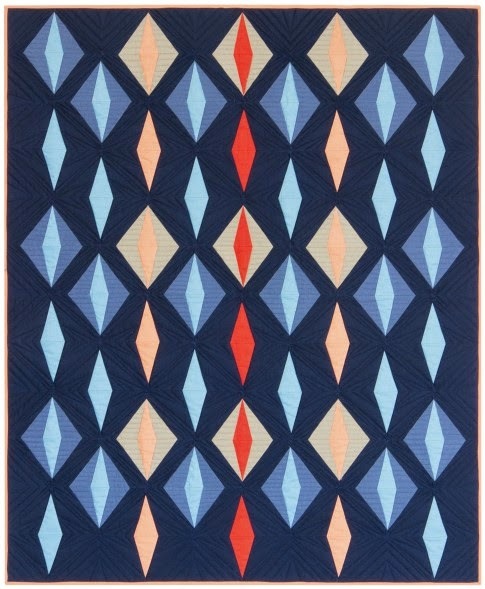 It is always a wonderful challenge and great joy to translate the formations into quilts." We love the precision and detail of this intricately constructed creation. 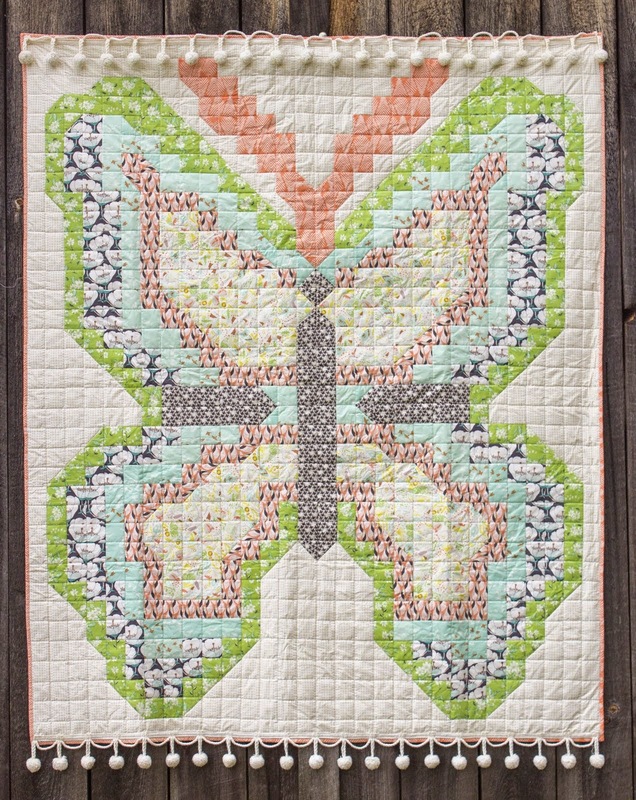 Joanne's work is machine pieced, hand-appliqued, and machine quilted. 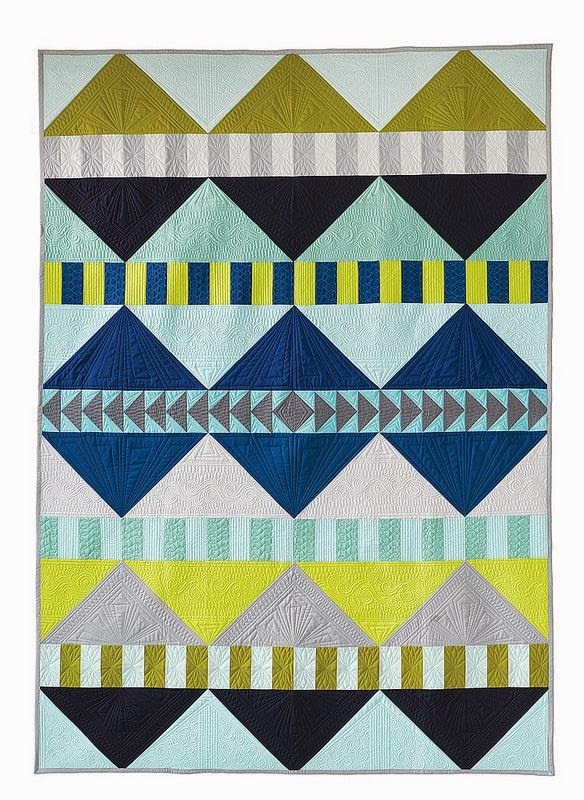 Labyrinth is a miniature green quilt which was donated for silent auction in Houston. 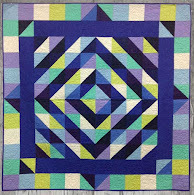 Sarah Ann writes, "This quilt was for our local Coastal Quilters challenge, with the them of 'Exit'. I figured that an entrance and exit are the same, so I made this labyrinth ( a maze) and did bobbin work using Razzle Dazzle thread on the edge of the stone. The green fabric is one of my hand dyes....."
If you look closely, you can see the old Syrian proverb that Sarah Ann embroidered in cursive writing around the outside of the labyrinth, which reads, "Be humble for you are made of earth... Be noble for you are made of stars." We think that this beautiful saying is perfect for the ethereal theme of Sarah Ann's intriguing work. Delicate white three-dimensional flowers give a lovely contrast to the sturdy, tropical leaves portrayed here. Judith's enchanting quilt was part of a display in Houston featuring plants used in healing arts and medicine. Her work is hand-appliqued and machine and hand stitched. 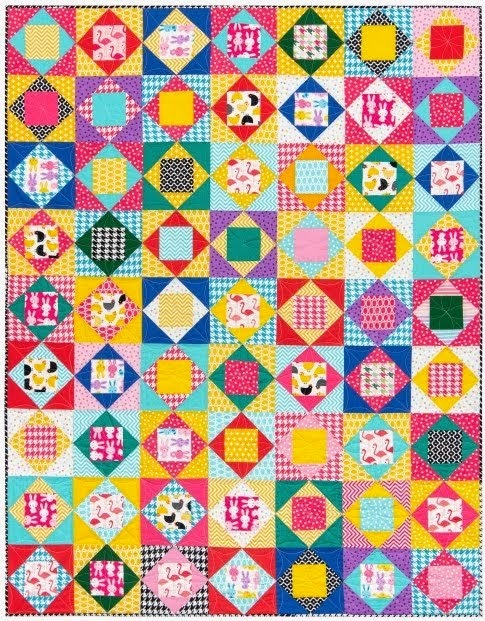 Dr. Eleanor McCain is a physician, an internist whose quilts decorate the walls of the building where she practices medicine. We like to think that her creations provide a wonderful point of conversation for patients and staff alike. 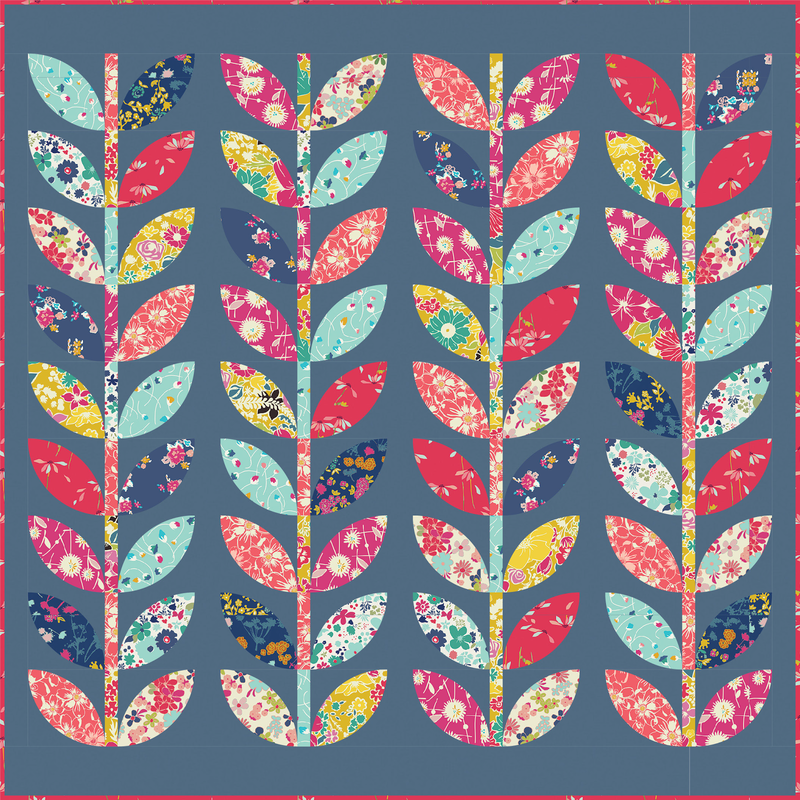 We'd love to see quilts in a medical office, as we think that quilts are so comforting and nurturing ! 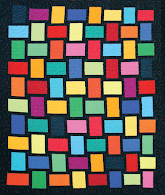 Eleanor's quilt was part of the Studio Art Quilt Associates exhibit at the 2014 AQS show in Phoenix. 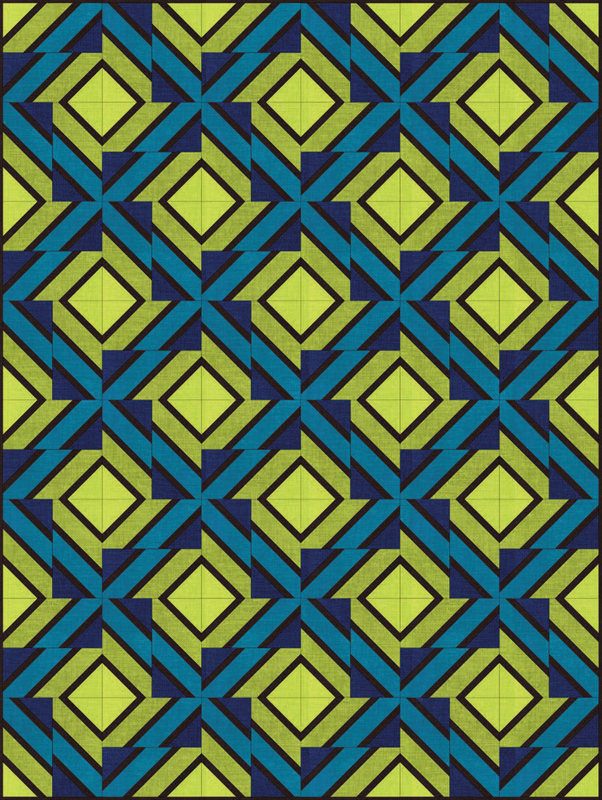 Eleanor writes, "Green 2 uses grid structure as a format for exploration of color and spatial relationships. 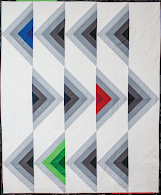 The hand-dyed and commercial cotton fabrics are cut, machine pieced, and machine quilted." Eleanor notes that some of her relatives are artists, and she was influenced by the work of her mother, a painter. 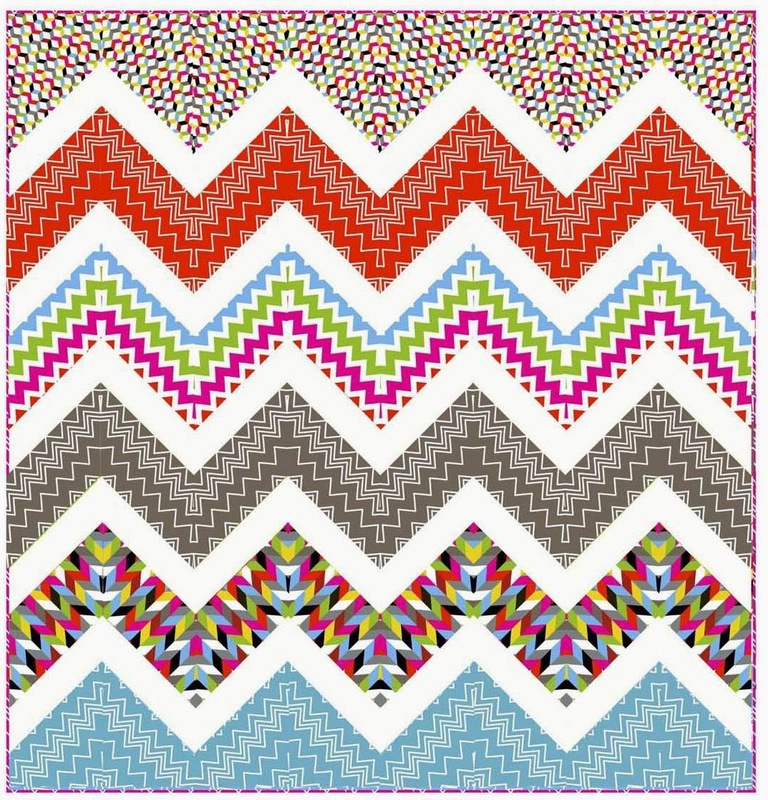 These rich, color-saturated fabrics really provide a feast for the eyes! We normally think of green as a cool color, but when it is surrounded by butterscotch and lemon yellow, or maize and chocolate brown tones, green is capable of changing its personality and projecting a warm vibrant aura which can really heat up a room. 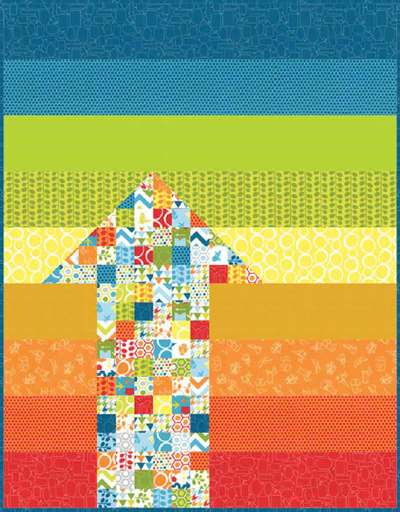 The largest member organization of the European Quilt Association, France Patchwork promotes quilting all over Europe. The organization celebrates its 30th anniversary in 2014, and the challenge chosen was the color, green. 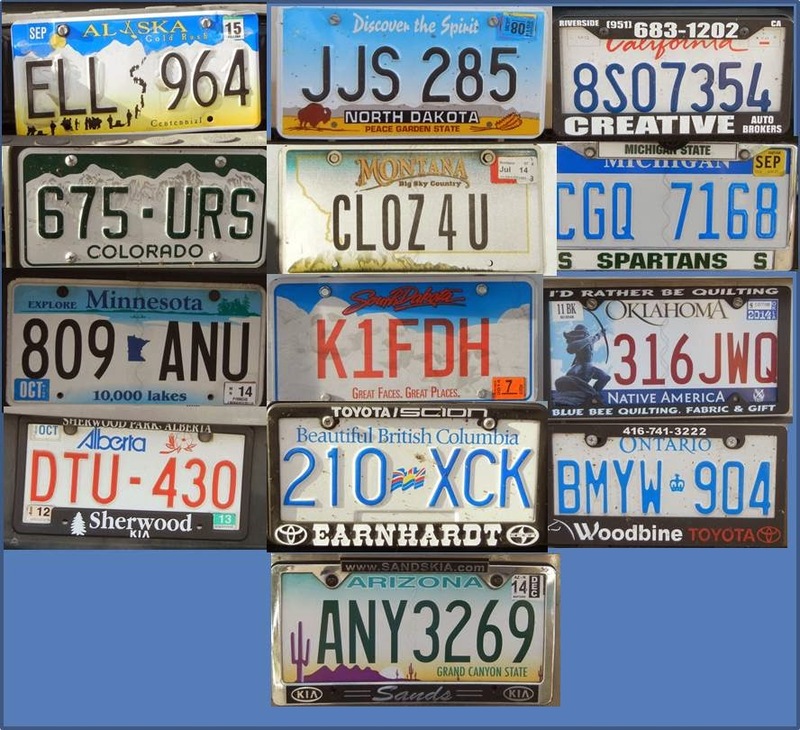 We saw this special exhibit, La Verts dans tous ses États, at the 2014 Road to California. Anduze, a region in Southern France, is well known for the Bambouseraie - a large park full of bamboo. Patricia Fuentes incorporated photos on fabric to evoke the scenery; we almost felt as if we were there. The bamboo stalks, leaves and garden flowers are delicately represented; the flowers are done in a translucent fabric. 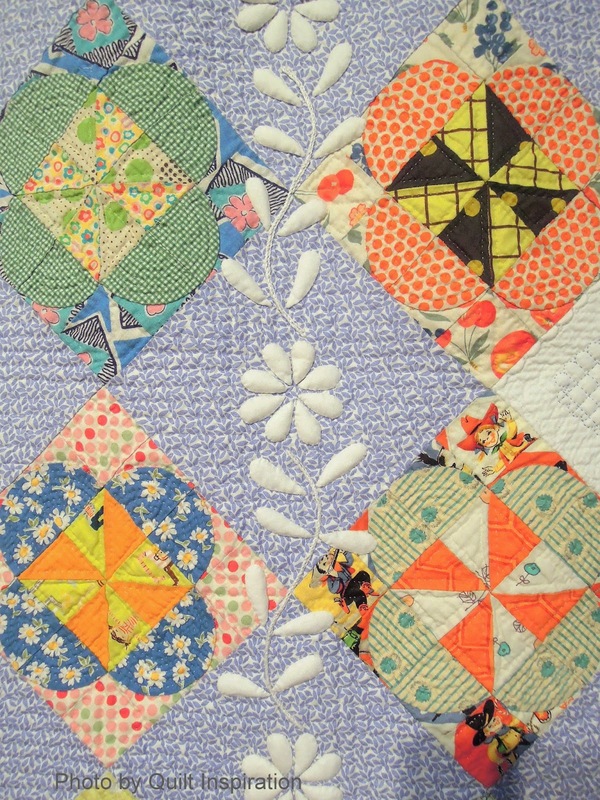 The flowers and some of the leaves are appliqued to the quilt, while others are three-dimensional. 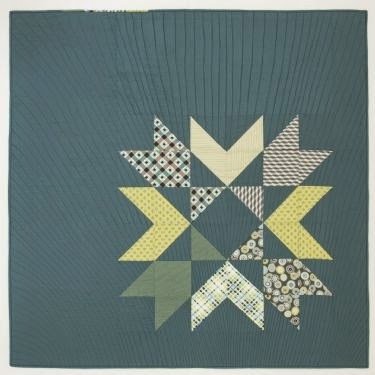 We enjoyed the soothing, grayed blue-green color scheme in this star quilt with its theme of Hope. 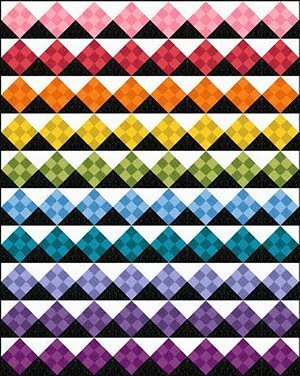 The star design is interesting; each right triangle appears to be pieced in a manner similar to a French braid. 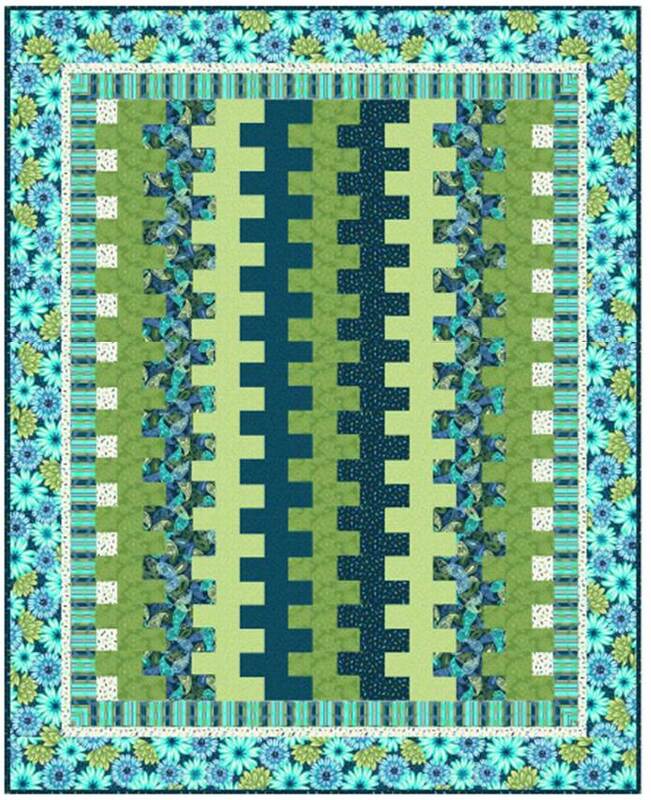 Three-dimensional leaves of ivy drape over this green-walled quilt, reminding us of a mossy garden. 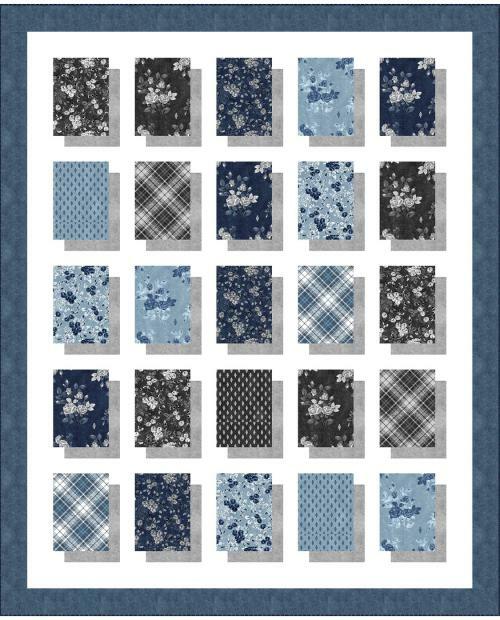 The fabrics are again interesting. They have a blurry, photographic quality - possibly they were made with a hot wax batik process (wish we knew). 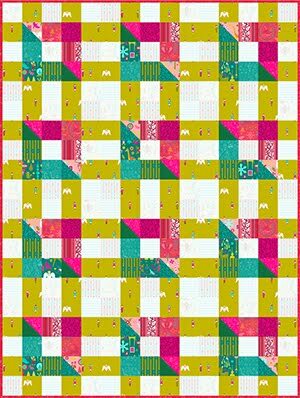 This pretty yellow-green sampler is made of individual mini quilts that were stitched together to make a panel. 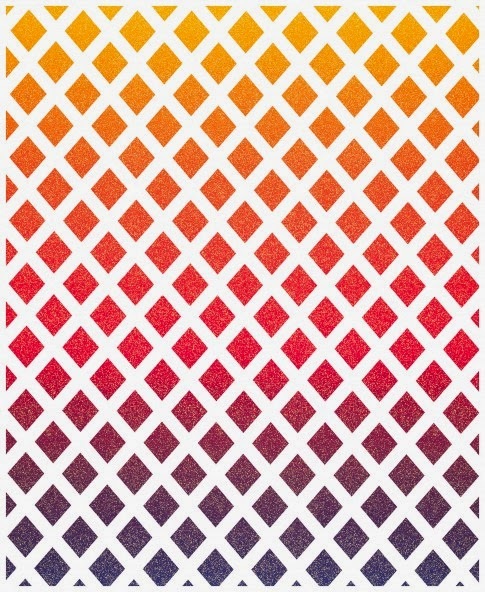 Each pattern is unique, but the colors tie them all together. We loved the "Green Man" whose face appears amidst the leaves. We are still seeking the attribution for Green Man; the artist was not listed on the card. 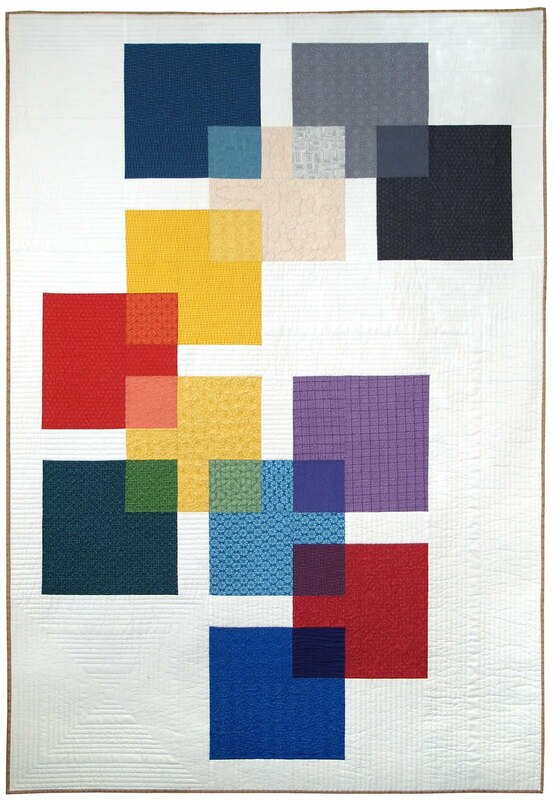 Contemporary quilt artist Marianne Bender-Chevalley is well known for her themes of nature and plants. In Feuilles she created the appearance of depth through the use of layering, light/dark, and stencil-like forms. The theme of Deforestation is represented in this asymmetrical log cabin design with areas of green surrounded by a swath of white. A convincing forest of triangular trees make up this Forêt. 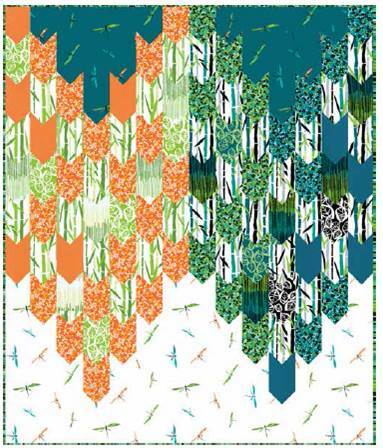 The trees were done in a variety of interesting solids and prints and a blue-to-chartreuse color scheme.